Futurology, future-casting or futurism (with a little ‘f’) used to be a serious business. Now it’s just become business. 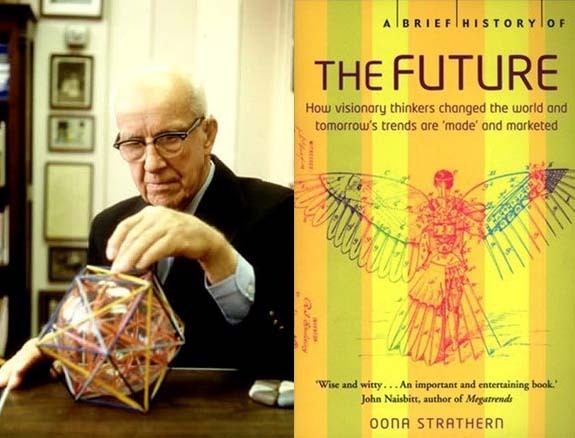 In that glorious spell of postwar speculation, futurism was linked with modernity as we all strove in the words of Buckminster Fuller to achieve the maximum benefit with the least means for the greatest number of humanity. Often technologically-driven, futurism optimistically projected ways of solving society’s greatest issues – war, starvation, environmental degradation, mass housing, mobility…. No doubt there are many involved in those noble pursuits today, but it is not for the most part done under the umbrella of futurism. That moniker goes to trend-spotters, innovation consultants and marketeers. The kind that hang out in Shibuya or Camden Lock with a notepad and a voice recorder. The kind that make off with wads of cash telling corporate brands where to stick their goods for maximum profit. You’re saying, Ok, lefty, things have moved on. Everyone’s got to make a quid. Thing’s just aren’t so clear cut anymore. I say, there is yet a space for freewheeling speculation outside of the service of brands. And we’re going to find that space. And sit down and draw.